Holding the distinction as the first Keeper of the National Register of Historic Places (albeit briefly), Russ Keune was a National Park Service alumnus, acclaimed restoration architect, internationally-recognized historic preservation leader, official of the National Trust for Historic Preservation, and one of the founding architects of our nation’s and the National Park Service’s now 50-year old, federal historic preservation program. Born and raised in Chicago, Illinois, Keune graduated with a Bachelor of Architecture from the University of Illinois in Champaign-Urbana in 1961. As part of his undergraduate studies he served three summers working for the NPS’s Historic American Buildings Survey (HABS) documentation teams in Harpers Ferry National Historical Monument, in the Connecticut River Valley of Massachusetts, and in mid-Coast Maine. After graduation, Keune joined NPS working at Harpers Ferry documenting the Chesapeake and Ohio Canal system after which he was assigned to San Juan, Puerto Rico monitoring the U.S. Army’s withdrawal from the historic fortification of San Juan as it was transferred to NPS. He was then assigned to the newly-established Minute Man National Historical Park serving as the first park architect. Keune returned to the University of Illinois in 1963 to pursue a Master’s Degree in Architecture. After graduation, he received an international study fellowship which resulted in his visiting twelve European countries in a newly-purchased Volkswagen. Keune referred to this time as a “professionally transforming experience.” His travels focused on studying urban European historic preservation programs which were then far in advance of those in the United States. At the insistence of NPS Director George Hartzog, Keune rejoined NPS in 1966. At 28, he became the youngest member, and only architect, of the seven-person NPS team charged with developing and launching the newly enacted National Historic Preservation Act – a key achievement of President Lyndon Johnson’s Great Society. In a four-month period, the NPS team developed such now familiar and fundamental national programs as the National Register of Historic Places, the Historic Preservation Fund, and the State Historic Preservation Office system. Keune took special pride in his role in developing the National Register Criteria – which continue to serve to this day. He was also instrumental in developing and launching the President’s Advisory Council on Historic Preservation and what is today known as the Section 106 Process. Keune left NPS in 1969, joining the National Trust for Historic Preservation serving for fourteen years as Director of Field Services and then rising to Senior Vice President for Preservation Programs. 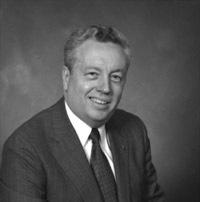 While at the Trust, he served as U.S. government representative to Rome, the Soviet Union, and Warsaw as well as working with foreign national trusts throughout the world. After leaving the Trust, Keune served as Vice President for Programs, U.S. Committee, International Council of Monuments and Sites (ICOMOS) then as Director of International Relations for the American Institute of Architects. More recently, he served as the Secretary of the Professional Practice Commission of the International Union of Architects, overseeing an international effort to establish and promote the first set of international and harmonized standards for the practice of architecture. Russ Keune last served as faculty in the Masters in Historic Preservation Program at Goucher College, Baltimore, Maryland where he taught classes in International Historic Preservation history, standards, and practices.